- Non-Toxic- Safe to use at home Ideal for Housebreaking.Perfect for use indoors, porches and patios. - The open type prevents cat litter and the cat does not easily stain itself. - Available in 3 color- Pink and Blue. We are a most trusted name amongst the topmost companies in this business, instrumental in offering high quality array of Cat Litter Tray. 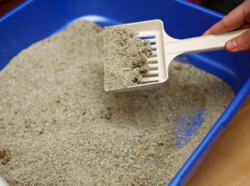 Keeping the diverse requirements of customers in mind, we are instrumental in providing Cat Litter Box.